SAN FRANCISCO and BEIJING, Dec. 06, 2018 (GLOBE NEWSWIRE) -- Dolby Laboratories, Inc. (NYSE: DLB) and Beijing Tahoe Film and Culture Development Co., Ltd. (“Tahoe Cinemas”) today announced an agreement to expand the Dolby Cinema footprint in China. Tahoe Cinemas is a subsidiary of Tahoe Group and its professional investment platform in film industry. Tahoe Group is a major enterprise in China with businesses extended to real estate, healthcare, education, film, finance and other fields. /EIN News/ -- Tahoe Cinemas plans to open 10 Dolby Cinema locations in China, extending the premium cinema experience to more moviegoers across the country. Dolby Cinema enables richer and more action-packed storytelling through Dolby Vision and Dolby Atmos. The Dolby Vision laser projection system uses state-of-the-art optics and image processing, delivers high dynamic range with enhanced color technology and a contrast ratio that far exceeds that of any other technology on the market today. The result is a dramatically different viewing experience that presents strikingly vivid and realistic images. Dolby Cinema continues to grow globally with more than 390 Dolby Cinema locations installed or committed in the U.S., Europe, and Asia. With support from all major Hollywood studios and a growing group of content creators around the world, more than 190 feature films have either been released or are committed to be released in Dolby Vision and Dolby Atmos. Dolby Laboratories (NYSE: DLB) is based in San Francisco with offices in over 20 countries around the globe. 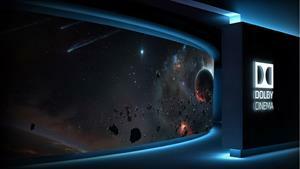 Dolby transforms the science of sight and sound into spectacular experiences. Through innovative research and engineering, we create breakthrough experiences for billions of people worldwide through a collaborative ecosystem spanning artists, businesses, and consumers. The experiences people have — with Dolby Dimension™, Dolby Vision®, Dolby Atmos®, Dolby Cinema™, Dolby Voice®, and Dolby Audio™ — revolutionize entertainment and communications at the cinema, on the go, in the home, and at work. About Beijing Tahoe Film and Culture Development Co., Ltd.
Beijing Tahoe Film and Culture Development Co., Ltd. focuses on developing high-end cinemas. Adhering to the brand value of "providing an extraordinary viewing experience for the audience," Tahoe Cinemas cooperates with international front-line designers and top film and television equipment technology companies to create modern Chinese style cinemas with its own characteristics - Tahoe cinema. Tahoe cinemas are located in major cities across China, such as Beijing, Shanghai, Shenzhen, and Guangzhou, and has signed 120 projects so far, strives to rank first in the industry in the next three years. Tahoe Cinemas has been innovative in developing cinemas. It not only creates the nationwide first healthy cinema with constant temperature, humidity and advanced haze-free ventilation system, but also introduces a variety of business forms such as indoor attraction for kids, coffee and book lounge, On-Demand Cinemas and more, which opens a new era of socialized movie viewing experiences from the traditional movie going experiences. As an important part of Tahoe Group's "Tahoe+" strategy, Tahoe Cinemas will gradually expand the industry blueprint based on cinema operations and ultimately become a comprehensive cultural industry group with businesses extended to film production, distribution, projection, acting brokerage, IP originality and others.